Bronwyn and Colin, we see all the love that you put into this beautiful place. Thank you so much, it was a huge privilege to stay here. It was our paradise for three nights. Cheers Jock and Jess. We will miss you. ‘Til next time. Dear Bronwyn and Colin, Thank you so much for a wonderful stay in your piece of paradise. Also for your kindness and hospitality. We all thought that this was one of the most beautiful place in Africa, if not the world! All the best for everything in future. Many thanks, Colin and Bronwyn, for a truly wonderful two nights and three days of peacefulness and pleasure, and for your generosity and veld-walk guidance. We hope to be back! 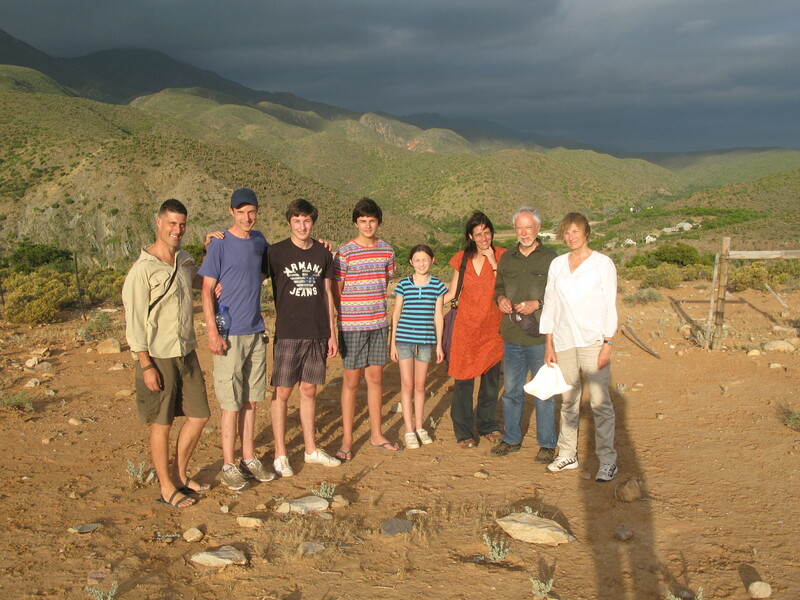 And thank you for introducing our British friends to life in the little Karoo. A great place to get away from it all. Fantastic scenery – so much to photograph. Thanks Bronwyn and Colin for all your help to solve our mini-disaster! Much appreciated. Christmas at River View Cottages – perfect! Our third visit but definitely not our last. Re-united with our lovely Jock and his greyhound friend who we named Gloria. Fishing great as always – about 200 altogether (carp, mudfish and yellowish). Thanks once again Bronwyn – hope you also had a great Christmas. Thank you for the opportunity to experience this beauty. We loved every minute. I suspect Jock has undergoing a frontal lobotomy – only way we could explain his good behaviour. Totally uncharacteristic for a Jack Russell! Guarded our door all night. Thank you for a lovely restful stay and the delicious apricots. Colin and Val, Plettenberg Bay. Rus vir ‘n mens se sill sal jy hier vind. Baie dankie hiervoor. As ek so oor die berg en rivier kyk en alles is still om my deer dink ek aan Koos Doep se gebed. Lei my Heer vanaand daarheen”. Our lovely night in December. Thanks for another great stay, Bronwyn. Accompanied by Jock and the two greyhounds, we did three of your walks at different times of the day. Experienced several mountain moods with the weather swinging from ghostly rain to sweltering heat. Fantastic. Plenty of good bird life to keep us on our toes too. I’m sure it won’t be long before we make our third visit. A beautiful spot. Thank you. Thank you for a lovely stay. A lovely place, so relaxing. What a great start to our road trip. Allan and Sunelle, Cape Town. What was supposed to be a one night stop-over to our destination turned into paradise. With a glass ofwine and the sunset frosting the mountains in front of us. Time spent in the river was amazing! Unforgettable! We’ll be back. My boyfriend, Greg was here in April 2011 on a motorbike trip. When he said he would like to bring me her to share this special place…I thought it must be cool! It is sooooo much more awesome than I thought it could be! What an unbelievably beautiful peaceful place and even more special – we discovered our common love of nature as we swam in the river and took in all the sights and sounds of this incredible place together. We discovered our love for each other that has been growing and developing over last eight months. Thank you Bronwyn and Colin for letting us into this unexpected little piece of heaven – we will definitely be back and stay longer next time! Blissful, beautiful an restorative in the best way. Thank you. The Old School House has become part of our family Christmas tradition. What a beautiful, peaceful Karoo valley to put the year in perspective. We love it here. Goodbye School House and 2012. Mika, Bella, Ruvan and Lauren. Cape Town.